Australia hasn't experienced an economic recession since the year Disney first released Beauty and the Beast. 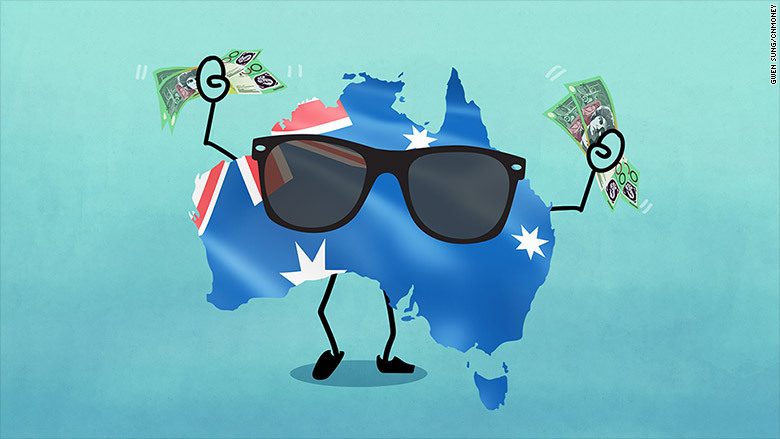 The Land Down Under has bragging rights as the only advanced economy not to record a recession since 1991, according to International Monetary Fund data. That means Australia even managed to escape largely unscathed from the 2008 global financial crisis. Australia's impressive economic track record is mostly due to two factors: the country's vast natural resources and China. A little bit of luck helped, too. For years, Australia supplied China's commodities needs, becoming a major trading partner. But commodity prices have crumbled recently, especially in the mining world Australia excels in. At the same time, China's appetite for metals and energy no longer looks insatiable as its economy slows ominously. No wonder why more people in the land of kangaroos and dingoes are worrying about the "R" word. "Digging stuff out of the ground and selling it to China has been a huge tailwind for Australia. Like all good things, they come to an end. The commodity wave has crested," said Josh Feinman, global chief economist at Deutsche Bank's DB Advisors. Warning signals are flashing. Wage growth has tumbled to a 17-year low just as the country's unemployment rate nears decade highs, according to UBS. Thanks commodities boom! Australia has avoided two consecutive quarters of negative GDP growth, the technical definition of a recession, because of its natural resources in the ground. A 20-year commodities boom -- fueled largely by China's explosive growth -- lifted prices of key minerals like iron ore to lofty levels. Australia simultaneously benefited from stable or even relatively cheap prices on imports. The combination provided a huge shot in the arm to Australians and allowed the country to weather global storms. In addition to lucking out on the commodities boom, Australia deserves credit for "good economic management," said Alexis Gray, an economist at Vanguard Australia. She pointed to structural reforms implemented in recent decades, including the removal of exchange and interest rate controls, the elimination of trade barriers, the floating of the Australian dollar and deregulation of labor markets. Buddy-buddy with China: Some of those moves brought Australia closer ties to China just as that country was racing to become the world's second-largest economy. China now accounts for a whopping 30% of Australia's exports. Being China's friend was great during the 2008 crisis. That's when Beijing ushered in powerful stimulus programs that boosted the country's demand for commodities. The tight relationship with China is less helpful now because growth there has slowed to the weakest pace since 2009. "Australian economic growth is now more strongly correlated with China than ever before, and the domestic economy is susceptible to shocks from China," said Gray. Related: Is Argentina's economy pulling a tango turnaround? Recession ahead? While it's not her base-case scenario, Gray warned Australia does face an "elevated" risk of a recession due to the China slowdown and commodities bust. That's led mining companies to dial back investment plans, hurting the jobs market. Australia's central bank has responded by slashing interest rates, moves that have helped cool off the red hot Australian dollar. That should be helpful because the super strong currency was hurting manufacturers. It's the main reason why Ford Motor (F) is shutting down a factory in Broadmeadows, a Melbourne suburb already facing 27% unemployment. Whether or not Australia succumbs to its first recession since the first half of 1991, the key for the future will be the country's ability to diversify its economy. Rather than banking on sky-high commodity prices, Australia is smartly trying to rebalance itself by boosting industries like construction, educations, finance and healthcare. But that change won't happen overnight in a country that has a love affair with mining. "So far this is only happening at a very slow pace," said Gray.